So a no-nonsense undying dynasties list based around the reliability of the 3+/5++ Cataphracts and the help of a very potent magic phase. The scenario was Spoils of War, and the deployment we rolled was once more Marching Columns. 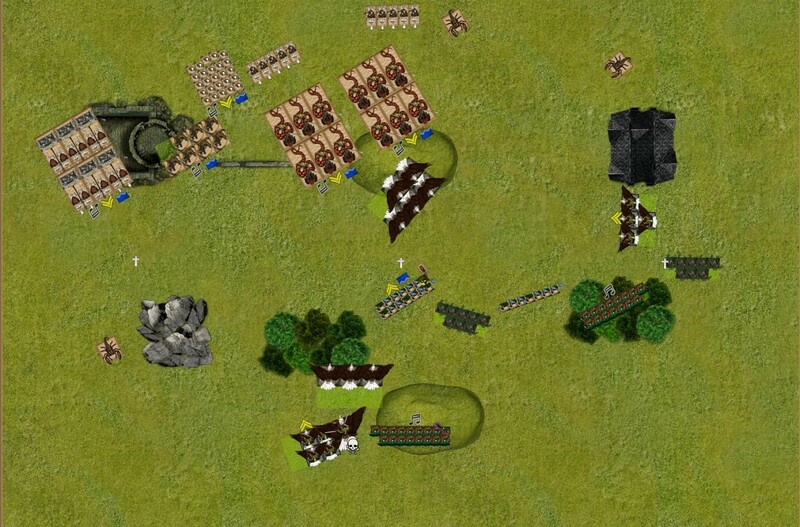 Going into the game I knew that I had an advantage when it came to objectives: my opponent had lots of scoring units, but all of them were his main line units. So if I played my cards right, I’d be able to face at least one less unit while it grabbed the spoils of war token and then maneuvered back into place. For magic my druid got Forest Embrace, Beast Awakens, Savage Fury, Totemic Summon and Break the Spirit: with a lot of combat phases ahead of us, I figured that I’d be better off with a good mix of augment spells that would help tip the combat in my favor. My opponent opted for the Spectral Blades and Hasten the hour for his hierophant, while the Master took Scrying, Know thy Enemy, Stars Align and Unerring Strike. 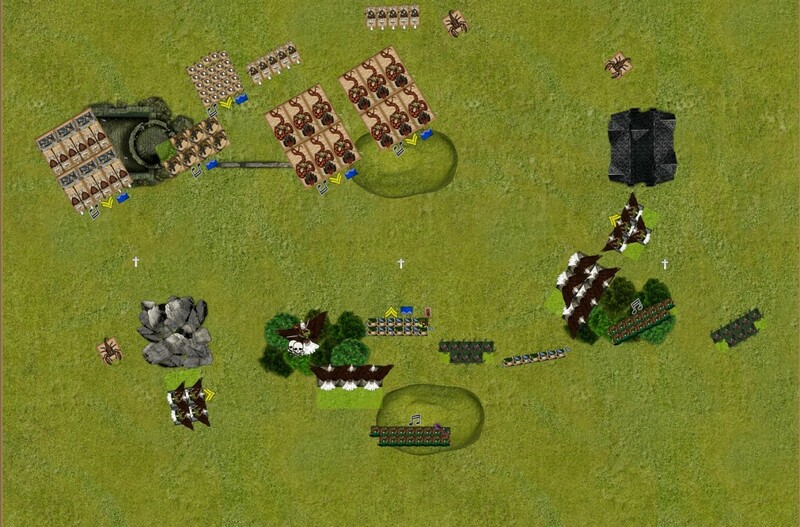 My adversary started deploying his units from his right corner towards the center, and once we had both placed 3 units took the opportunity to start the game, keeping two of his Scorpions in reserve. This allowed me to counter his deployment, keeping my scoring units far from his battle line and creating a fast but hard hitting center with the Kestrels, Prince, Dancers and the Eagles. My opponent was cautious with his first turn of movement, maneuvering into a slightly oblique line, and unwilling to advance far: the placement of my kestrels meant that if he moved up too far he’d have to deal with flyers behind his lines. So instead, both of his cataphracts maneuvered to zone my kestrels and eagles, while the shabtis moved into a better shooting position. Magic started off with a boosted Hasten the hour on the left kestrels, which I dispelled with my dice, leaving the Stars Align to go off on the Shabtis: these took aim at my Eagles protecting the Prince, dealing a couple of wounds. The first order of business for the sylvans was to put pressure on the UD, so as to force the Scorpions to appear near the enemy battleline and not behind my lines; to do so, I advanced the big line of Forest Eagles to block both cataphract units, and in a position where ignoring them would give the eagles a turn 2 charge on the hierophant bunker. This way a unit of cataphracts would have to charge, and risk a failed restrain pursuit test that would put the enemy scorers within combo-charge range from the bladedancers, kestrels and the Prince. 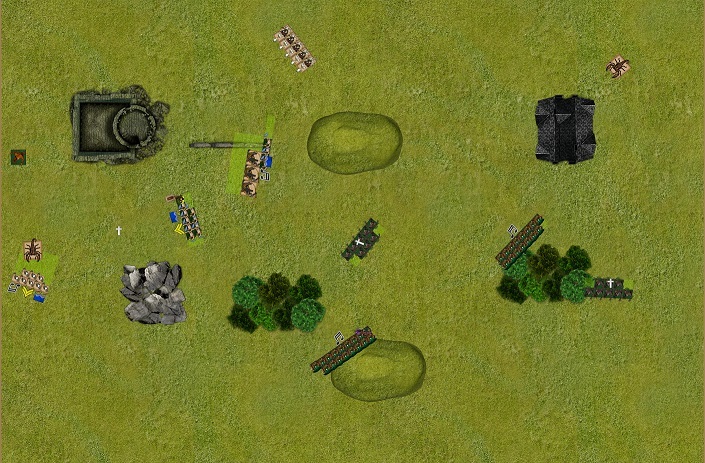 The rightmost part of the army advanced to provide cover fire and claim the right-handside objective marker. I then used my second eagle unit and the small bladedancers to create no-go zones for tunneling scorpions. Magic was a complete failure this turn: the totemic summon was dispelled, but at least I kept some Veil Tokens for the next phase. 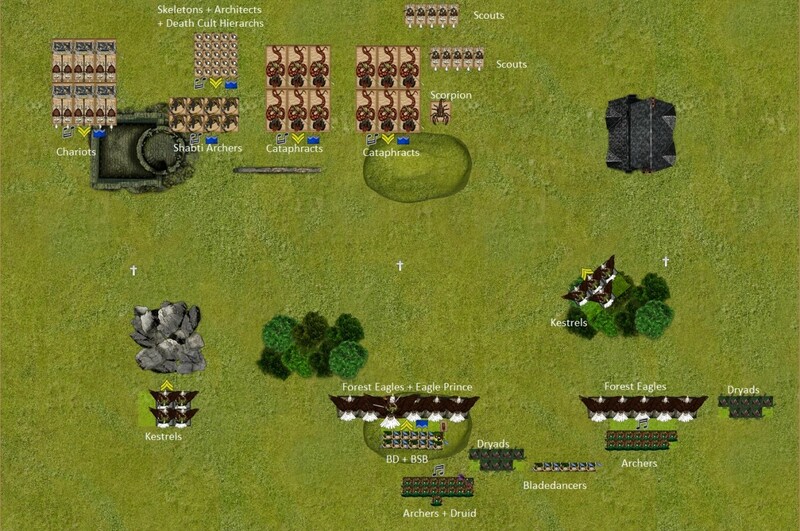 Shooting proved to be more effective, killing a Shabti and putting two wounds to the scorpion in the enemy backline. The leftmost Cataphracts charged into the eagles, and both Scorpions appeared: oneright next to the left-hand impassable feature, trying to flush out the kestrels hiding behind and preventing the chariots’ and shabtis’ advance, and another right behind the building to keep my second kestrel unit under control. Magic started with a high casting of Unerring Strike on my Eagle Prince: I let it through, and suffered two wounds for my troubles despite the 3+/4++ save. This allowed me to dispel the buffs on the Cataphracts, making them easier to deal with if I charged: the shooting bounced off the Prince’s armour harmlessly, which was a relief. In combat, the cataphracts dealt 5 wounds to the eagles, suffered one back and forced the birds to flee through my lines, where they’d rally on the following turn. Unfortunately, the Cataphracts’ restrain pursuit test was successful. After some deliberation, I decided to only send the big dancer unit against the Cataphracts, an 8+ swift charge: by keeping the Prince in reserve, I’d be making sure that he wouldn’t charge to his death on his own if my dancers failed. As predicted, the dancers did fail their charge and stumbled forward! The second eagle unit flew to their rescue, redirecting both Cataphracts at the same time. The left kestrels relocated away from the scorpion, giving the hurt prince some protection against future shooting/magic. In the magic phase I managed to power through the Totemic Beast, which appeared right next to the character bunker! Shooting put one more wound to the Scorpion in the back, and a couple more to the shabti archers. Unwilling to let my scorers take the middle token,my adversary charged both units of Cataphracts into the blocking Eagles. 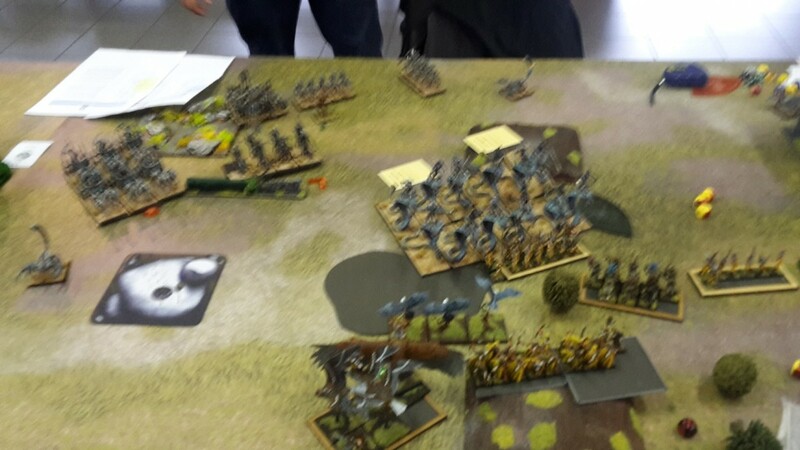 The rest of the army maneuvered a bit, both Scout units moving towards the Totemic Summon to try and shoot it down. The Chariots, now rid of the Kestrel meanace, stepped on the left objective marker. 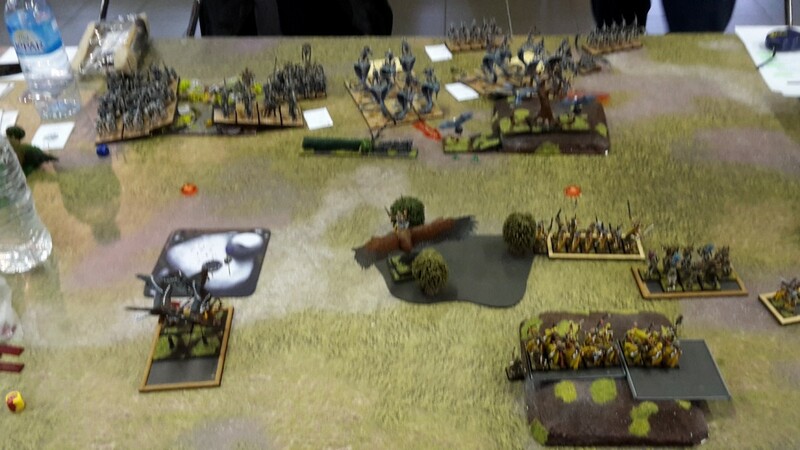 With my totemic beast in a position for a turn 3 charge on the hierophant bunker and both cataphract units within charge range of my entire army, I used my binding scroll on the Stars Align, then dispelled the Unerring Strike and had to let the Spectral Blades through on the left Cataphracts. Shooting didn’t do much, failing to wound both my Eagle Prince and the Totemic Beast. 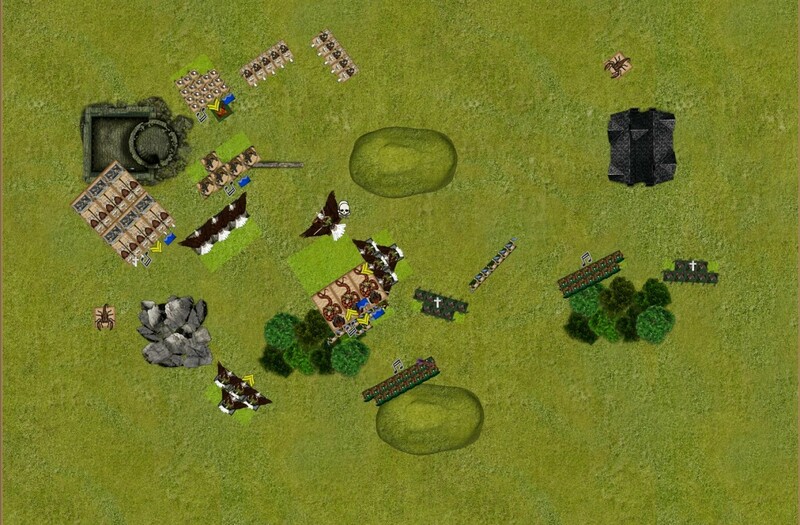 The eagles predictably took a beating in combat, and died trying to flee towards my lines. This time both units pursued and charged into the big Bladedancer unit waiting right behind. 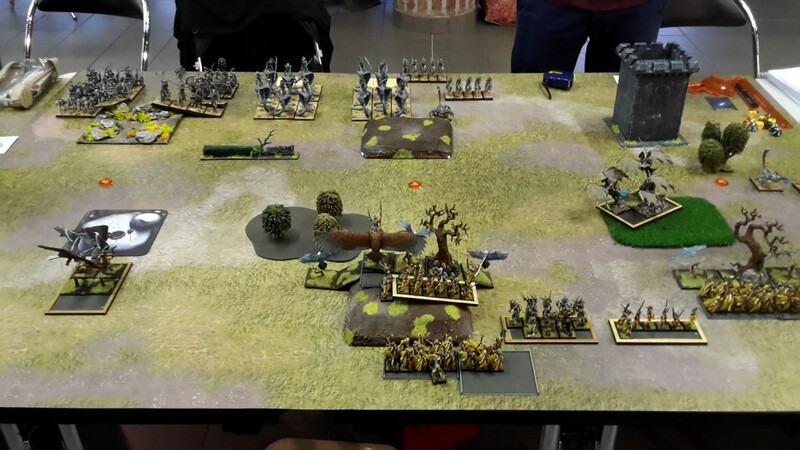 The elves countercharged : the right kestrel unit fell into the unboosted Cataphracts’ flank, while the Prince spotted the same unit’s other and charged in too, clipping their corner. The Totemic beast turned and charged the front of the hierophant bunker. The rallied eagle unit flew in position to redirect both the Chariots and the Shabtis,ensuring that the elven elite would be undisturbed while dealing with the cataphract business in the middle. Magic was focused on boosting the Dancers in combat: the Beast Awakens was dispelled,which allowed me to cast both Forest Embrace and Savage Fury on them! Shooting managed to kill the right scorpion, while to the left another Shabti Archer died to the Sylvan Archers’ arrows. 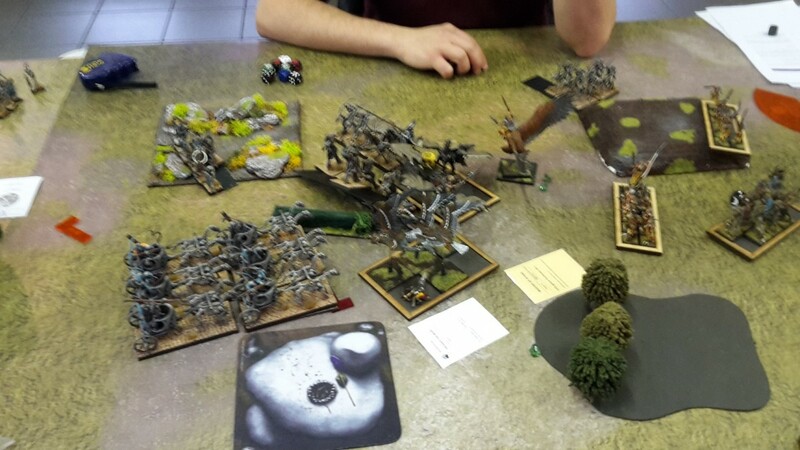 In combat I went for the bunker fight first: the Totemic beast only managed two wounds on the Master Hierarch, getting two wounds back in return, but its breath weapon kept it in the fight. In the main event, the Prince was challenged out and instantly killed the cataphract champion, while the flanking Kestrels performed admirably: between their attacks and those of the Bladedancers (dancing the 3++aegis save dance), three more cataphracts fell, for a grand total of 14 unsaved wounds! The Dancers, now bolstered by Distracting and forcing my enemy to reroll 6’s to hit, only took 3 wounds back from the cataphracts’ attacks! 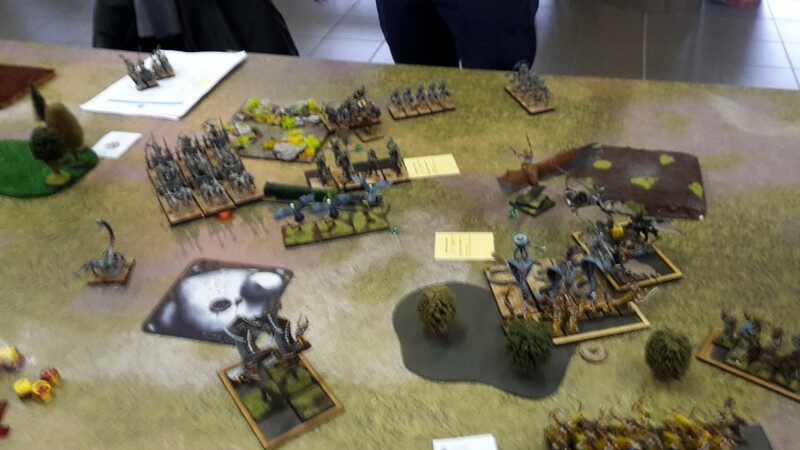 This was enough to crumble the rightmost unit of undead, and drop the right one to 8 wounds remaining! 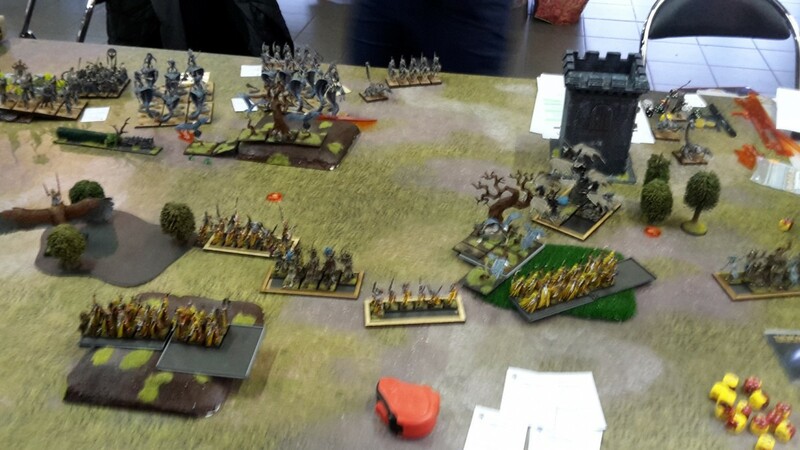 The Prince, now out of combat, reformed and the victorious kestrels overran into the second cataphracts’ flank. The chariots flanked the Eagles, a unit of scouts flanked my totemic beast and the Shabti reformed to shoot at my Eagle Prince once more. In the magic phase myopponent was faced with a dilemma: try to save his mage, and thus abandon the Cataphracts, or vice versa. In the end, he went for saving the mage bunker, but a low magic roll meant that only one spell got through, healing a single wound on the Hierarch. The shabtis once more failed to do any damage to the Prince with their S5 bows! In combat the Dancers predictably killed off the remaining cataphracts before they could strike back, reforming. The Totemic Summon got another chance of killing the Hierarch, but only dealt a single wound! 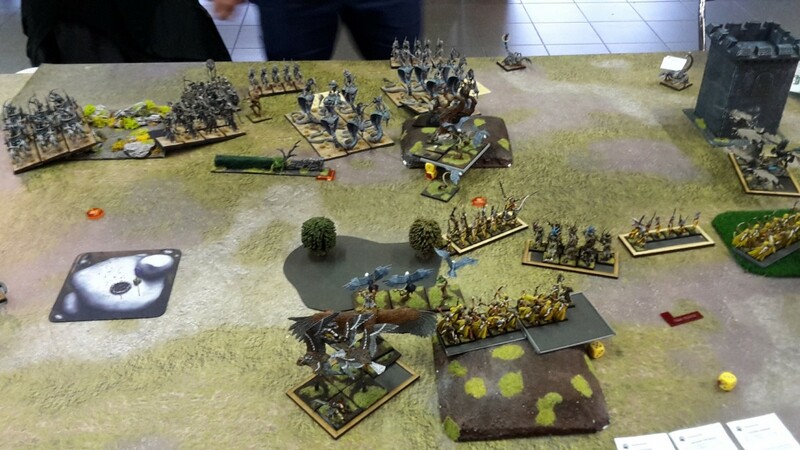 The undead failed to wound it back, but it then failed its break test and was forced to flee towards the west: both units pursued, the mage bunker going through the ruins and ending up around 19” from the Eagle prince. Finally, the chariots made short work of the eagles and reformed. With the bulk of the UD shock troops now dead, I saw the opening for a decisive win: both kestrel units fell upon the 5-strong shabtis (front and flank). The Prince spotted the rear of the Hierophant Bunker, now no more than 8-strong, and decided to go for the kill. Both kestrels made it in, but the prince failed his charge and stumbled forward. Both dryad units had by now picked up a token, securing the objective for me. In magic I got one of the most successful magic phases possible: I got card no5, so a 9/5 spread, and by going for several small casting attempts I managed to power through Beast Awakens on the flanking Kestrels, Break the Spirit on the chariots ready to countercharge and a Totemic Summon on top of that, appearing close to the hierophant bunker! It was in combat that disaster struck at last: Both Kestrel units failed their Ld8 rerollableFear checks. Despite that, they managed to deal around 12 wounds to the shabtis, only for them to regenerate 9 back! They retaliated and killed three Kestrels in total, managing to tie combat. Now my kestrels were sitting ducks! The Chariots spotted the bottom kestrels’ flank and charged in despite the Break the Spirit, only taking 3 wounds going in. The Hierophant and co popped their Relentless company banner, braved Dangerous Terrain once more and landed a good 13” away from my Totemic Beast. A unit of Horsemen zoomed right in front of it, too, making sure that I wouldn’t be able to charge the bunker’s rear on the following turn (we were running out of time, so that would be our last turn). Magic was focused on the Shabti archers now: I had to let the Scrying off, and that brought an animated statue back. In combat the chariots smashed the flank kestrels, while the ones fighting to the front were forced to flee and were caught in pursuit by the Shabtis. 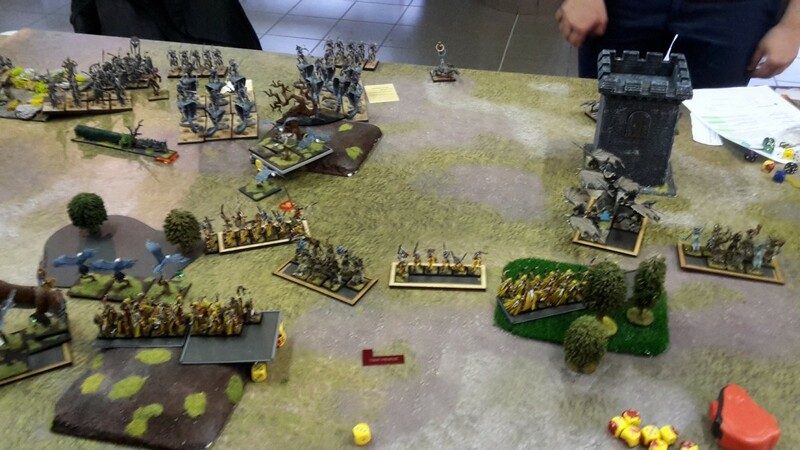 The latter pursued into my Prince, who was sitting right behind that combat after his failed charge. 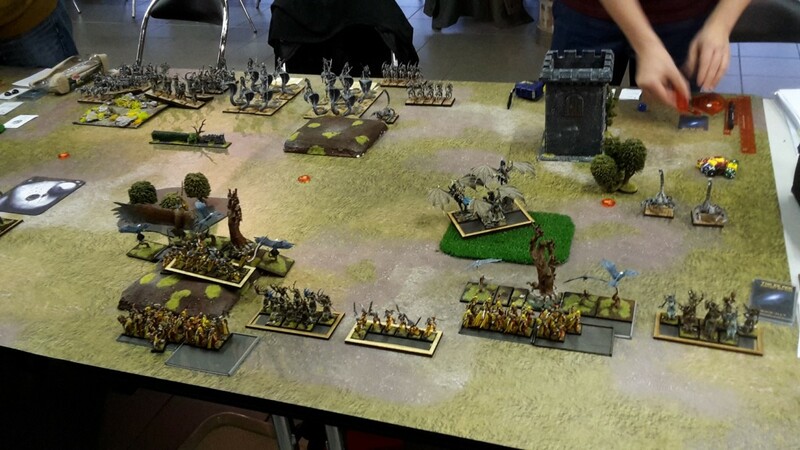 To wrap up the game I charged the small dancer unit into the shabtis to help out my general, the big Dancer unit with BSB went into the chariots’ front, and the totemic beast charged into the scouts right in front of it. Magic boosted the Dancers with Beast Awakens and the Forest Embrace, and that allowed them to completely destroy the chariots on the charge. In contrast, the Prince/Shabticombat didn’t go as smoothly: the Prince was challenged out by the unit Champion, failed his Fear test (Rerollable again), and all of the wounds that he managed to do were regenerated. The champion then hit and wounded with two of his attacks (no longer benefiting from the Rending Banner), and I proceeded to fail my two 3+/4++ saves once more, resulting in a very dead prince. The Dancers dealt enough damage to the shabtis to stay in combat, bringing the game to a close. The final (disastrous) turn cost me 1500 points, which turned a projected massacre victory to a 13-7 win for the SE! Overall, I have to say that the game went as planned, excluding the final combats! The flying threats kept the enemy in his corner and tighly packed, allowing my scorers to claim the objective, while the big units of eagles made good use of their large footprint to redirect multiple units at once and give my army some more maneuvering space. The usefulness of the 5-strong eagle squads is also demonstrated in that they can take a Cataphract charge, flee, rally and then fly in front of something else later during the game. 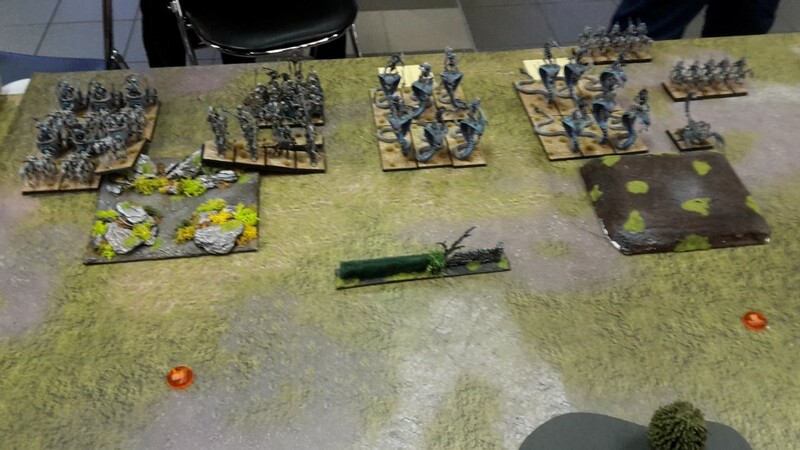 There were a couple of moments where the game could have gone from good to great for the sylvans, namely the Totemic Beast charge into the mage bunker, the subsequent failed charge from the Prince into the rear of the same unit (rear + charge + 4 wounds from overkill in challenge would have meant a dead bunker in only two combat phases), and finally the kestrel/shabti debacle! But still a very enjoyable game, and a small win that was what we needed to reliably win the round: in the rest of the matches our UD took a small but hard-fought loss against the SA, the OK fratricide ended with a 20-0 for our player and, finally, the DL comfortably got a 16-4 win against the enemy shooty SE. With four wins out of four matches, we were now moving up to the first row of tables for the final! What could go wrong, right? Check this space in a few days to find out! Damn, this list is just bananas. Not many people can say "aha! Now I have your 12 Cataphracts exactly where I want them - right in front of me!" Wouldn't it have been possible to use the second beast's breath weapon to weaken the bunker even more and then finish the characters off with the archers?